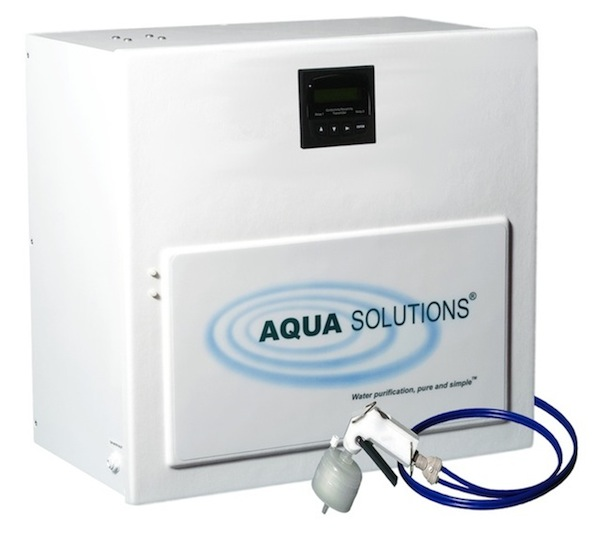 An AQUA SOLUTIONS RO system can effectively remove up to >95% of the contaminants in tap water, thereby reducing the operating cost of a DI system by more than 90-95%. A single RO system can be used to pretreat the tap water feed for several Type I or Type II DI laboratory water purification systems, and/or point-of-use locations. Incoming tap water contains more than 170 parts per million (ppm) of total dissolved solids. DI water usage exceeds 40 liters per day on a Type II DI System. DI water usage exceeds 20 liters per day on a Type I DI System. Can the DI system alone produce the desired quality and quantity of purified water that is needed for the applications at hand? IF NOT, AN RO PRETREATMENT SYSTEM IS REQUIRED. Would it cost more overall (including capital and operating costs over 1-3 years), to process the tap water via DI alone, or with a combination of RO plus DI? IF DI ALONE COSTS MORE, AN RO SYSTEM IS JUSTIFIED. This compact Laboratory Reverse Osmosis ("RO") System is for operation on virtually any quality tap water, containing up to 1,000 PPM of TDS. It economically produces 60-Liters/hour of RO purified water by removing >95% of the contaminants in the incoming tap water. The system includes a built-in, high-capacity activated carbon pre-filter and a 130-Liter pressurized tank to store the RO purified water. AQUA SOLUTIONS' Reverse Osmosis Pretreatment Systems include a pressurized RO storage tank, which eliminates the need for level controls, overflow piping, and transfer pumps. RO production is 60-Liters Per Hour. Includes 130-Liter pressurized storage tank reduces the risk of contamination and eliminates the need for a transfer pump. The System has a built in TDS Meter to monitor water quality. Pressurized Storage The included 130-Liter pressurized storage tank reduces the risk of contamination and eliminates the need for a transfer pump. TDS Monitor Details The System has a built in TDS Meter to monitor water quality. Input Power Requires a 120 VAC electrical outlet within 5’ of the right side of the system.